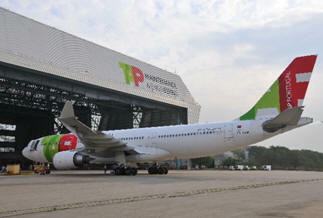 November 5, 2010 - As the controlling company of TAP Maintenance & Engineering Brazil since 2005, TAP Portugal will now take advantage of Rio de Janeiro facilities in its Latin American subsidiary to perform C-Checks on a series of A330/A340 aircraft in its fleet. Upon completion of the program?s initial stage, the first aircraft was delivered to TAP Lisbon on October 10. The nose-to-tail services provided for the aircraft were done in line, at Galeao airport, thus avoiding undesirable costs of transfers to position the airplanes for the overhaul. The program will run through mid-February, with a short break in December, in order to make better commercial use of the aircraft. It is expected that other airplanes from TAP?s fleet will arrive at the hangars of TAP M&E Brazil by year end. ?The first aircraft (CS-TOM) went through a standard C-Check that periodically inspects the condition of all aircraft systems and equipment. The service was performed without interruption, over a period of 13 days, and ended one day before the scheduled deadline, assuring the TAT (Turn-around Time) agreed upon by the companies. The second aircraft (CS-TON) will go through a C-Check 2.1 + A, and we also expect to cut the TAT down by one more day, as reported by the Vice President of Operations of TAP M&E Brazil, Engineer Valter Fernandes. ?We are pleased to receive the fleet from our parent company, TAP, and to be able to perform the services more quickly than the contract deadline. This contract shows the level of confidence and commitment that TAP Lisbon has regarding the technical quality of the services of TAP M&E Brazil. We will dedicate the same efforts to delivering the next three aircraft before the deadlines, as well, if possible,? states the President of TAP M&E Brazil, Engineer Nestor Koch. The Airplane Project Manager of TAP Portugal, Engineer Pedro Santana, also commented on the success of this particular project: ?It was undoubtedly a difficult, but at the same time, gratifying challenge. Moving up the delivery date of the airplane by one day, as well as its arrival in Lisbon with no abnormalities, makes us extremely happy and proud.? TAP Maintenance & Engineering Brazil is recognized, worldwide, for the quality of the services it provides to its clients. The company has more than 80 years of experience the complexities of aviation maintenance; from repairing and overhauling landing gear, engines, and APUs to avionics, electrical, hydraulic and pneumatic equipment, among others. TAP has been certified by the world?s main aviation authorities, such as the National Civil Aviation Agency (ANAC), in Brazil, the Federal Aviation Administration (FAA), in the U.S., and the European Aviation Safety Agency (EASA). TAP M&E Brazil is the only company member of the Airbus MRO Network in Latin America, and it is Embraer?s first authorized service center in this region. The company is specialized in heavy maintenance for large and medium aircraft, as well as in component overhaul and repair. It has a capability list for working with over 17,000 aeronautical items, meaning that most of the components installed on the aircraft can be repaired right on the company?s premises, thus providing nose-to-tail services for clients with aircraft manufactured by AIRBUS, BOEING or EMBRAER, and with less aircraft down time for maintenance. TAP M&E Brazil offers a broad range of Aeronautical Maintenance services that meet a wide variety of demands, including engineering and interior refurbishing projects, avionics design and installation, structural repairs, installation of winglets, A, B, C and D Checks, technical training, and others.